Tom Hocking, outgoing moderator of the Fellowship of Grace Brethren Churches, led the meetings this week in Simi Valley, Calif. 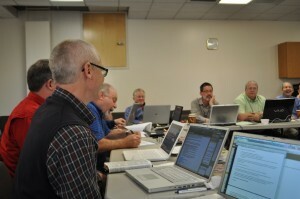 The fellowship council, the leadership of the Fellowship of Grace Brethren Church, met this week in Simi Valley, Calif. 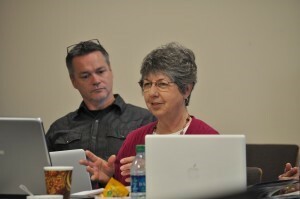 Led by outgoing moderator, Tom Hocking (pastor of the Bellflower, Calif., Brethren Church), the group reviewed applications for new churches, discussed plans for this summer’s annual conference at Wooster, Ohio, and attended to other matters at hand. Janet Minnix, president of Women of Grace USA, was among the national organization executives to report to the Fellowship Council today. In the background is Clancy Cruise, pastor of the Grace Brethren Church, Marysville, Ohio. Today, the last day of their sessions, they welcomed the executives of Grace Brethren national organizations. They ended the day with final committee meetings before adjourning until their next meeting in the summer.